Kenroku-en is the one of the three beautiful gardens in Japan. | Why don't you go on a trip to Japan? Kenroku-en is the one of the three beautiful gardens in Japan. If you have a plan to go to Kanazawa or Ishikawa prefecture, you will think about Kenrokuen Garden for attraction. Kenrokuen garden is the one of the three beautiful gardens in Japan. 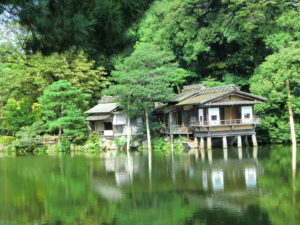 You can see Japanese style traditional garden and relax in green.This was the second time to visit there for me. 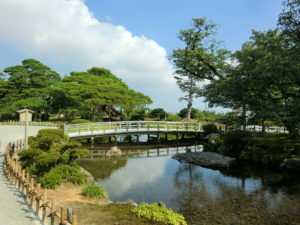 The history of Kenrokuen Garden dates back to 1546. It is said to have originated when the 5th lord Tsunanori built the Renchiochin house on the slope facing the castle, and gave its garden the name Renchitei. Later the 12th lord Narinaga and 13th lord Nariyasu built an expensive garden which had the basic design of the magnificent landscape garden in the strolling style that we know today. The garden, which has a particular charm in every season, has been designated as a Place of Scenic Beauty. Many people come from not only all over Japan but also overseas to enjoy it. Since it was originally part of Kanazawa Castle, the garden is located next to Kanazawa Castle so you can visit both at the same time. As you take the garden’s map it is so spacious, you need to take plenty of time walking around the garden. Gorgeous pine trees are placed and these look very old. This pine tree called” Karasakinomatsu” was grown by the 13th lord of the Kaga clan from a seed that he obtained from Karasaki in Omi. 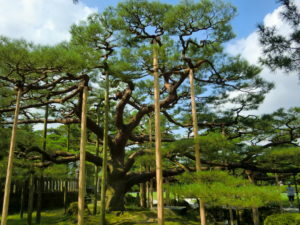 In winter, ropes are stretched over all the pine trees to protect them from the weight of snow, which called “yukitsuri”. It is unique scenery in winter season. There are some ponds in the garden. Typical Japanese garden feature a central pond with rocks and trees arranged around it. One of the important of garden design techniques in Japan is re-creating scenery of nature. Making a microcosm of Japan’s natural landscapes in a garden is a unique technique. 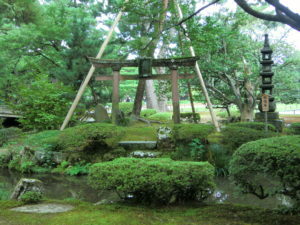 A tori gate is placed in the garden. Variety of flowers such as cherry blossoms, irises, azaleas and like can be seen at different times of the year. After that, I went to Kanazawa Castle which located next to the Kenroku-en garden so it is easy to move there.